Superior talks about starting out. “In the beginning X had a DJ named Kason but when he got locked up I took the torch and ran with him. Waah (C.E.O. Ruff Ryder) had me running around promoting X trying to get him in record pools.” Superior says his relationship with X has now soured. “I don’t know why our break up happened. I guess it’s because he has phony friends around him but I’m cool with Waah and Darion, they’re like brothers to me. The business breaks up friendships but I have love for him.” In 2000, X came to Superior with an A&R position at his new label Bloodlines. This situation lead Superior’s artist Jinx becoming a part of Bloodline Records. The label was heavily marketed but never released anything except sound tracks. First distributed by Def Jam the label is now distributed by Warner Bros. Superior explains if your an artist who does movies you will always have a record deal because labels always want to distribute your soundtrack. “Jinx and a female named Kashmir are Bloodline’s hardest artist. They want him to release albums but so far he has only put out soundtracks.” explains Superior. Your not really a Yonkers artist until Tony of Vision Quest heard of you. For twelve years Vision Quest has been the number one supplier for hip hop music in Yonkers. Tony does more than just sell music to fans he keeps close tie with all artist from Yonkers. “We are working with Ruff Ryders, we working with D Block, we working with Mary’s camp. Mary has female artist she is working with so we are supporting are home and our neighborhood.” Vision Quest first started when Dwight Fuller Tony's partner came from Brooklyn to Yonkers. They first ran their store at a counter in a bike shop. At that time nobody knew there was a market in Yonkers explains Dwight. “I remember when I first brought Teddy Riley to Yonkers. They visited my store in Brooklyn and told them you have to go to Yonkers. Teddy was like Yonkers what’s in Yonkers. Since than a lot of artists have came to Vision Quest. X came through for their first album and over 5000 were out in the street. Mary came through and did a signing. Busta came through and the people showed mad love.” Today Vision Quest is a 10,000 foot square store where you can purchase CDs, TVs, DVDs, magazines and more. Last year the Vision Quest had a freestyle battle every Friday. Rappers came from everywhere to battle it out for the freestyle Fridays crown. A cat from Yonkers won that entire battle explained Tony. 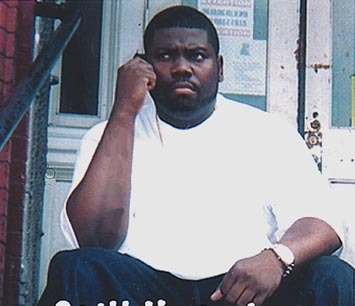 “The Yonkers rapper beat cats from queens, Brooklyn, everywhere. Cats from Brooklyn were like we going to get you’ll next year.” The two have seen Yonkers artist grow into super stars and the talent increase in years. “Yonkers now is like a small little Motown. We have young boys writing their behind off, young girls sing their behind off.” explained Dwight. Bootlegging has hurt ever aspect of the music industry. Dwight explains the effects of bootlegging. “Bootlegging hurts us and the artist. As bad are the Lox are there not platinum. The Lox are platinum off the street but not off the shelves. So when they go make their new deal it’s from an aspect that they never made platinum.” Vision Quest plans for whatever changes that industry might make. Tony says in the future the industry is going to come back to singles. People are going to want to make a disk of their favorite singles and right now Vision Quest is equipped to do that. The way this work is you fill at a list of songs you want and they burn it for you. 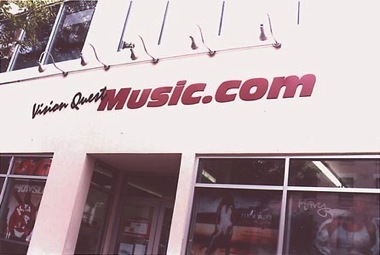 Your list of songs will be save to the stores sever for a year and if you break, loss or damage that CD Vision Quest will replace for $2. It’s a good idea but none of the record companies have come close to allowing that so Vision Quest is waiting on the industry. Right now Tony and Dwight plan to build a sound stage and a recording studio above their shop where artist can record. When the next group of platinum artist comes out of Yonkers there’s no question at one time or another they would have had to come through Vision Quest.